Thursdays and Fridays: Mrs Painter. Our wonderful teaching assistants are Mrs Hodgkiss and Mrs Durham. PE takes place on Tuesday and Friday afternoons. The name Australia means ‘south’. Australia is in the southern part (hemisphere) of the world. Australia’s seasons are the opposite to the seasons in the United Kingdom. When the UK is in winter, Australia is in their summer and when the UK is in summer, Australia is in their winter. Most of Australia is made up of desert, called the Outback. Temperatures in the Outback range from as high as 50°C on summer days, to -10°C during winter nights. Australia also has rainforests. The Daintree Rainforest is the oldest rainforest in the world. You can find more than 1200 types of insects here! Ayers Rock (also called Uluru) is located in the centre of Australia. Ayers Rock is 348 metres high and over 600 million years old! The Great Barrier Reef is the biggest coral reef in the world. Australia has lots of unique wildlife. Some cannot be found naturally anywhere else in the world! These include koalas, kangaroos, kookaburras, emus and platypuses. Australia has lots of unique wildlife. Some cannot be found naturally anywhere else in the world! Australia is also home to lots of dangerous creatures, such as venomous snakes and spiders! Africa. This week we are learning about the continent Africa. Last week it was Red nose day and Year 1 wanted to find out more about the people and life in Africa. We began our project by asking questions about Africa...Where is Africa? What do we already know? What would we like to find out? We were very lucky to have Mrs Hodgkiss tell us all about her time living in Africa. She showed us photographs and artefacts. 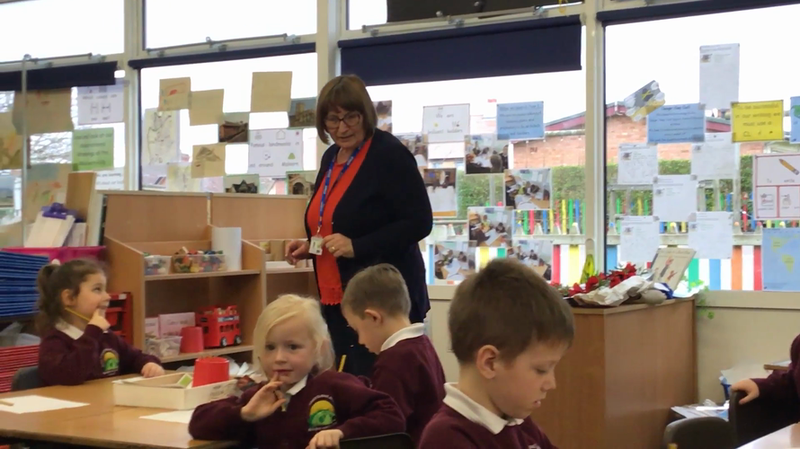 Mrs Hodgkiss played us some African music and using percussion instruments we created our own piece of African music using similar pitch, tempo and dynamics. We then compared the African music to modern UK music. We then worked in a small group to research facts about Africa. We explored and discussed how Malvern is the same or different to Africa. We looked at Comic Relief and how the money raised helps people in Africa and the UK. Mrs Hodgkiss singing South African song called Jan Pierewiet. This is a South African barn dance song from the times of ox wagons and the Great Trek. Hier's 'n soentjie vir jou*. Here's a kiss for your life. There is coffee in the can. It is a ten day celebration of the best of British science, technology, engineering and maths. British Science Week falls between 8-15 March with the theme for 2019 being 'Journeys'. 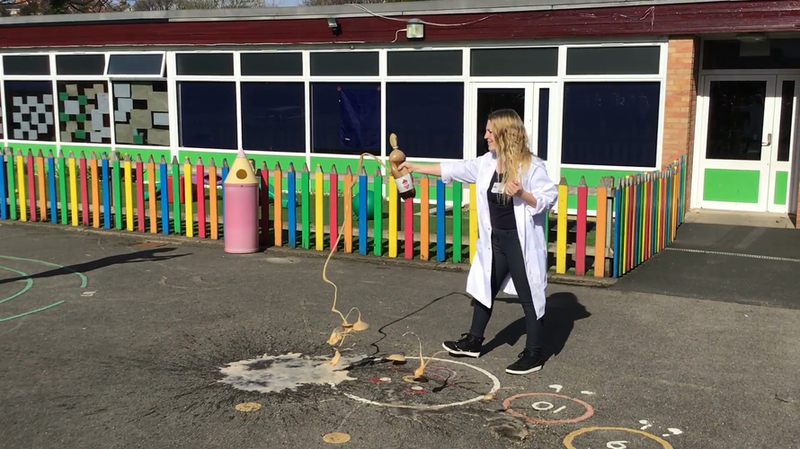 Take a look at some of the science activities we have been doing in Year 1. What causes Diet Coke and Mentos mints to erupt when mixed together? We think that it’s all to do with the science of bubble formation, believe it or not. The surface of a Mentos mint appears to provide a highly efficient place for tiny bubbles to form (these places are known by the boffins as nucleation sites). When Mentos are dropped into Diet Coke, these bubbles form very rapidly. As a result, the carbonated part of the Diet Coke reacts explosively causing an eruption. Did you know? For every litre of Diet Coke there are 4.3 litres of dissolved carbon dioxide gas. This gas escapes from the drink very quickly when Mentos are added to it. 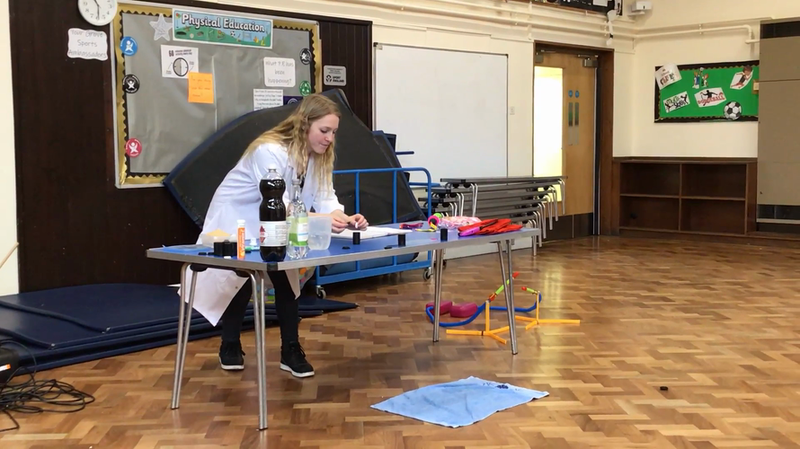 During our Silly Science fun, we watched the Professor add fizzy tablets to water in a container, to generate carbon dioxide gas. This raised the gas pressure enough for the lid of the container to pop off. This half term we are being explorers and exploring the world. Year 1 are 'Going on a bear hunt'. Through reading this wonderful and exciting story, we will be looking at different species of bears that live on each continent. For example: American black bears, Brown bears, Asiatic black bears, Sun bears, Sloth bears, Giant Pandas, Polar Bears and even some story bears such as Paddington bear and how the Teddy bear got it's name. We will be looking at different environments, climates and variation of clothes for a starter! Reading: Listening to and discussing a wide range of poems, stories and non-fiction at a level beyond which they can read independently. • Recognising and joining in with predictable phrases. • Learning to appreciate rhymes and poems, and to recite some by heart. • Being encouraged to link what they read or hear read, to their own experiences. • Making inferences on the basis of what is being said and done. • Predicting what might happen on the basis of what has been read so far. Writing: Saying out loud what they are going to write about. • Sequencing sentences to form short narratives. • Discussing what they have written with the teacher or other pupils. • Reading aloud their writing, clearly enough to be heard by their peers and the teacher. • Rereading what they have written to check it makes sense. Spelling, Punctuation and Grammar: Beginning to punctuate sentences using a capital letter and a full stop, question or exclamation mark. • Using a capital letter for names of people, places, the days of the week and the personal pronoun 'I'. • Knowing how words can combine to make sentences. Read and listen to We're Going On a Bear Hunt. Year one have been swishy-swashying and splash-sploshing through the picture book We're Going on a Bear Hunt by Michael Rosen, illustrated by Helen Oxenbury. In this video, Michael Rosen performs the book - why not sing along with your copy at home! written by the author Eugene Trivizas. Holly class have been searching the environment for uses of everyday materials. Over this half term we will be investigating some of the properties of materials and finding out why they are used in certain items. Our Material World. Come and look at our fantastic display of our learning. What are year 1 common exception words? Common exception words are words where the usual spelling rule doesn't apply; such as the common exception words "friend", "there", "they" and "said". Some of these exception words are used frequently, so children are introduced to common exception words in year 1 and year 2. Christmas Craft with our Year 6 Reading Buddies. We were reading and following instructions. Reading buddies is a program in which two or more individuals read together. For example, older students can read with younger students, and volunteers from the community can read with students of all ages. A Reading Buddies program can help model good reading. As with any skill, reading needs to be practiced on a regular basis, and with this practice as well as modeling, students can improve their skills. On Wednesday 21st November Holly Class celebrated Diwali, the Hindu Festival of Lights. The name originally comes from the word dipavali, meaning a row of lights. Wherever Diwali is being celebrated you will see shops, houses and public places decorated with small, earthenware, oil lamps known as diyas. They are usually placed in rows on window sills and outside buildings as decorations. It is celebrated around the world by people who follow the Hindu religion. The Festival of Lights, as with most ancient legends, helps us to know the truth of victory of good over evil. As part of our P.E. we have been learning Bollywood style dancing! We learnt some basic moves and incorporated these into our routine. What is Diwali? Diwali is the five-day festival of lights, celebrated by millions of Hindus, Sikhs and Jains across the world. Diwali, which for some also coincides with harvest and new year celebrations, is a festival of new beginnings and the triumph of good over evil, and light over darkness. These photographs is part of our display of our work from the book 'Where the poppies now grow', is our English working wall, in our classroom. We have loved exploring this book and have produced some fantastic work. I am a true advocate of sharing good practise and love to showcase and celebrate the children's learning. I put these photos on my personal twitter page. To my surprise, Hilary Robinson the author of 'Where the poppies now grow' and Martin Impey the illustrator both sent me lovely comments and have retweeted our photos on their own twitter pages, generating lots of likes and positive comments! The carefree childhood for Ben and his best friend Ray becomes a distant memory when they join the army to serve their country. But, in the midst of battle can their friendship survive? We are reading the book 'Where the poppies now grow' by Hilary Robinson. Childhood friends, Ben and Ray, find their innocent war games become real as the Great War rages around them. Set during the First World War, in simple rhyme, Where the Poppies Now Grow takes readers on a journey of friendship set against a changing landscape of innocence, of war and then finally, of peace. Naughty Bus. By Jan and Jerry Oke. We are using this book in our Geography and English lessons to explore UK towns. In the story, a child receives a toy bus as a present and has great fun exploring the world with his new toy which turns out to be quite a naughty bus - or is it the child who is being naughty?!! This is a very unusual picture book with a story told through close up photography and mainly narrated by the toy bus. The book cleverly recreates children's imaginative play and is great to use as a springboard for learning ideas. •	Recount of a bus journey. •	Re-tell story or one event. •	Speech bubbles for characters waiting at bus stop. •	A new event for the bus at night. •	Instructions how to catch a naughty bus. •	photo story of an adventure around school. Look at our fantastic gymnastics! Go year 1! We have been looking at some of the local artists in and around Malvern. A popular artist is Antony Bridge. We used his paintings as inspiration for our own observational drawings of Malvern Hills.